The river was always there, one of those which fan through Texas, draining the high plains, running down through the limestone hills, and the coastal plain before draining out into the Gulf. None of the rivers - the Nueces, the Brazos, the Colorado, the Guadalupe, even the River Grand, which now forms the border between Mexico and it's one-time territorial possession - are deep enough to have been navigatable for more than a little distance. Their valuable service to settlers was in providing a reliable water source, rather than a river-highway into the interior. And the presence of the river, and the San Pedro Spring (which once burst up out of the ground, gushing like a fountain with considerable force) was one of the reasons that the Spanish established a mission and a sketchily manned presidio, early in the 18th century, which establishments shifted positions very slightly over ten or twenty years, until everyone was more or less content with the arrangement of the string of missions along the river, the presidio, and the acequia - the water-distribution system, which fed the cultivated fields. Over the next century, as San Antonio grew and morphed from an outpost of Colonial Spain, the river continued to be important to the people who lived along it's banks. 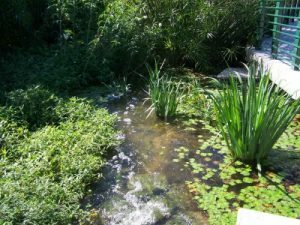 In the mid-19th century, Frederick Law Olmstead (who would eventually contribute a bit of key city-scaping - that of Central Park - to New York City) observed that all the nicest houses in San Antonio had gardens that backed on the river, and swimming and bathing in it was a very popular diversion. Having been founded because of water, water became an integral part of San Antonio - but now and again, as with all good things, there was just too darned much of it. A disastrous flood in 1921, which drowned fifty people, made it perfectly clear that "Something Ought To Be Done." The initial plan called for a dam, upstream in Olmos Park, and a bypass channel to route excess water away from downtown. The plan also called for paving over the bend in the San Antonio River between Houston Street and the Villita Parkway, using it basically as an underground storm-drain - but that was where the San Antonio Conservation Society took exception. Wrangling over what to do continued throughout the rest of the decade, while a local architect named Robert Hugman worked up a beautification scheme, calling for walkways at river-level, ornamental bridges landscaping. Hugman wanted to call his development "The Shops of Aragon and Romula" which doesn't have quite the same ring and brevity of "The Riverwalk" - but he believed in it to the point of keeping his own office in the area. In 1939, funding became available through the WPA, for the initial 17,000 feet of walkways, some twenty bridges and a number of ornamental plantings, and fountains. In the mid-40's the Casa Rio restaurant opened. HemisFair, in 1968 added another significant length to the original; eventually there would be eight major hotels, one shopping mall, and the original Casa Rio would face competition from more than fifty restaurants, star-scattered the length of the meandering landscaped promenade. The Riverwalk has been expanding ever since, by fits and starts in either direction, north and south, as residents and tourists discover - or rediscover - the joys of living on the river. 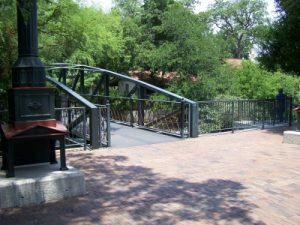 Long-term plans call for extending the Riverwalk - with bike trails, meadows and stands of native plants, another thirteen miles or so, all the way south, to link up with the original Spanish missions. Indeed, San Antonio lives by the river, in more ways than the early Spanish settlers could ever have known.